It’s not just that the clothes in Downton Abbey are pretty, though they are—especially on the younger Crawley sisters, who get to take advantage of both youth and wealth in their sartorial choices. But costume design is about more than beautiful clothes; it’s also about how the costume figures into the storytelling of the show. On Downton, clothing is a living part of a character’s existence; it externalizes the tensions of wealth and status using an easily understandable visual language. Downton has scored both a win and a nomination in this category already. This third season demonstrated a far weaker mastery of plot and character than those first two years, but costuming is still one of Downton’s greatest strengths. Since the show’s inception, the wardrobe team on Downton Abbey—which won a 2011 Emmy for the show’s first season—has managed to echo the period’s preoccupations through wardrobe, from the pre-war period in the first season to the latest episode, set in the 1920s. The difference from a period piece like Mad Men is that Downton’s storytelling is almost entirely dependent on its sartorial choices. To move forward one of the period’s harshest realities, appearances matter. After all, clothing for the Crawley family is entirely about keeping up appearances. No one in the Crawley family does anything except go to elegant dinners or do paperwork. No one wears an apron to protect a uniform, or a black dress that doesn’t show dirt, or white serving gloves that would indicate a spilled drop of soup. Lord and Lady Grantham and their daughters dress in silk and gold because their position requires that they outwardly perform their wealth and status. And that’s all they do: Being expensively attired and attended to is their job in this fading, aristocratic society. With each sumptuous costume, the Crawleys defend their right to exist; similarly, when they require their servants to wear uniforms, they reinforce the divide, to tell a story about class and birthright. It’s a visual contrast laden with significance for the modern viewer, but it is one constantly restated in the show—to appear is to be. You can’t be an earl if you don’t look the part, and if you don’t look the part, then who are you? In this context, of course clothing is important. In most respects, the exterior trappings of each person at Downton are far more important than the person underneath, whether they are a footman or an earl’s wife. The clothing defines the role, and the role defines the life. That’s quite a story to pack into wardrobe design. The script and the costumes often work hand in hand, bringing the Crawley’s financial reality to the screen. This third season brought weddings to Downton: One expensive wedding dress nearly bankrupted the estate, while another is torn off by a sobbing jilted bride. A missing shirt nearly gets a valet fired. Mary Crawley, as a married woman, reads Vogue in her free time. During the Great War, the family scrimps on clothes; in the roaring ’20s, they splurge. At its best, Downton brings you into its own conversation about the clothing—much as it brings the viewer into the conversation about the expensive upkeep of the estate. After all, keeping up appearances is a messy and costly affair. The clothing is just the icing on the cake of what is already an enormous machinery built entirely around looking good. 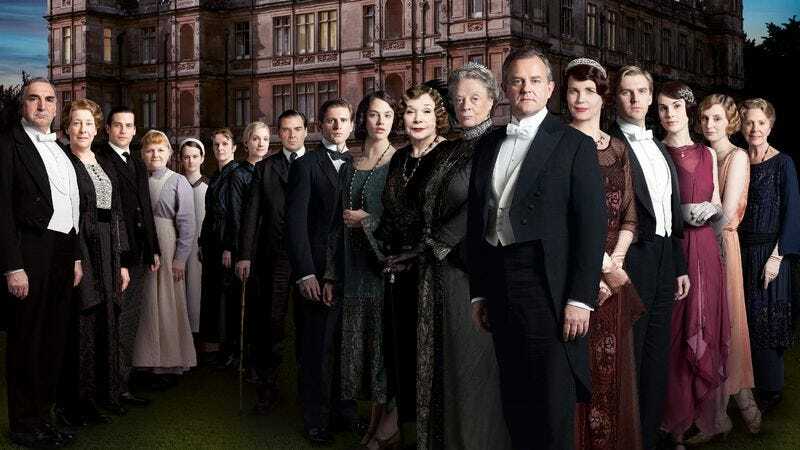 The denizens of Downton are engaged in a constant performance to be picture-perfect at all times; their fashion, more than any other cast on television, is truly costume. The characters are playing the roles of their lives. If only for this, Emmy voters should take notice.